Buy Viva Pinata for PC in India at the best price. Screenshots, videos, reviews available. Bringing a vibrant and engaging gaming experience to the Windows platform, Viva Pinata appeals to kids, adults, casual gamers and enthusiasts alike. This uniquely customizable and social game rewards and challenges all players regardless of their skill level and presents a customizable, social and spontaneous experience in which gamers play an absolutely crucial role. The Viva Pinata world is an evolving paradise teeming with fantastic living pinata creatures and vibrant plant life, all determined by the player's choices and actions. 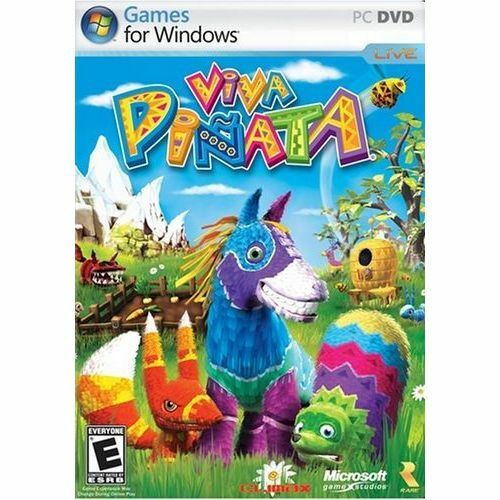 "Viva Piñata" offers easy installation, reliability standards and support for key features of Windows Vista, including the Games Explorer and Parental Controls. • Your world. Your choice of contents will determine which of the piñata species are attracted to your world because they all have individual requirements. Sowing grass, digging ponds, planting flowers and growing trees all affect which of the unique piñatas you will see. It's not just about plants, either; there is a whole range of ornaments and structures that could be decisive. Your reward for creating an appealing paradise is to watch the piñatas visit and eventually reside there, which is where the fun really starts. • Your piñatas. Once you have resident piñatas, you can begin to personalize your loyal community. Piñatas can be individually named and given their own personally designed tag to put on display as a declaration of their home turf, and the customization doesn't end there. You can make the colorful critters more distinctive by customizing them with all kinds of costumes and accessories. • Interact with the piñatas. Getting to know and understand the personalities and requirements of your piñatas is essential if you want them to stay happy and thrive. Make your world their ideal paradise, and they'll want to raise a family and expand your community. • Interact with the characters. Players decide how much help they want from the local guides, shopkeepers and work force. Go it alone or get them involved — you choose. • Interact with other players online. Via the Games for Windows — LIVE online community, players can contact other gamers to lend a hand or trade items. • It's happening outside. It's not just new piñata species that are drawn to your world; untamed sour piñatas with bad attitudes and troublemaking ruffians do their worst to spoil your creation and must be dealt with.